Speechreading is a highly useful skill that anyone can develop to help them better understand another person’s speech. CHIP has been offering speechreading classes for over thirty years. Several of our highly qualified instructors are accredited by the Canadian Hard of Hearing Association (CHHA). 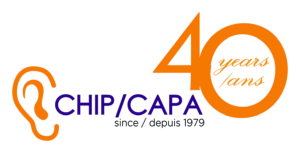 CHIP uses the Canadian Hard of Hearing Association’s National Speechreading Program, a Canada-wide initiative that ensures participants receive the best quality instruction in speechreading and communication strategies. Our instructors are open to any questions or concerns you may have about your own communication difficulties or about how you can best help those around you with hearing loss. Our courses not only help participants improve their overall sense of independence and ability to advocate for themselves, but also provide valuable information regarding hearing loss in general and the rights of people with hearing loss, as well as assistive listening devices and community resources to help participants fully engage in all aspects of life. REGISTRATION FOR THE SPRING 2019 SESSION IS NOW OPEN! Once these skills are learned, they can be used at work, school, while travelling, at family gatherings, in restaurants, and in many other social situations. CHIP offers two 10-week sessions a year, one in Fall and the other in Spring. To inquire about our classes, please contact our office at 514-488-5552 ext. 4500 or info@hearhear.org. Our Cell number for texting is 514-797-2447.